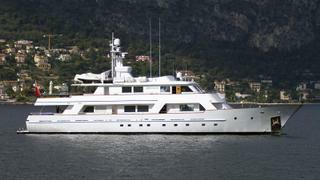 The 39.6 metre motor yacht Commitment, listed for sale by Mortola Yacht & Ship, has been sold in an in-house deal. Built in steel and aluminium by Italian yard Carp Navi to a design by De Vries Lentsch, Commitment was delivered in 1990 with a major refit in 2013. Accommodation is for up to 11 guests in five cabins comprising a master suite on the bridge deck, two VIP suites and two twins plus a Pullman berth. All cabins have entertainment centres and en suite bathroom facilities, while the master and VIP suites also have television screens. Rich mahogany panelling surrounds the main saloon, which comes with comfortable seating, a bar and an entertainment centre including a large screen television set and a sophisticated sound system. Forward is a formal dining area with seating for 10 guests. Outdoor areas are well equipped for al fresco entertaining, including a large aft deck with built-in seating, table, wet bar and barbecue area, while the flybridge hosts a plunge pool, sunbathing areas, tender stowage and a crane. Twin 856hp Caterpillar diesel engines draw on 50,000 litre fuel tanks to allow a range of 3,000 nautical miles at her cruising speed of 12 knots and she was fitted with zero speed stabilisers during the 2013 refit.